From left to right, neighbor helper, shelter administrator Christy Dunlap, book club facilitator Kathy Ison, book club member Chase Smith, neighbor Jack Thompson, book club member Chris Bell, assistant Leandra Jones, book club member Casey Hackworth, Modern Woodman member and book club facilitator Debra Grover, and book club members Mike and Kelly Annon. Modern Woodmen members, Chapter 5458, partnered with the Next Chapter Book Club recently to plant a lovely flower garden at the Brick House Shelter. The shelter at 320 N. Hinde St., Washington C.H., helps any family that is facing homelessness in Fayette County, including single women, children, couples with children, and single parent families. The Next Chapter Book Club, a national book club for adolescents and adults with intellectual and developmental disabilities, has a reading club in Washington Court House, through a partnership with the Carnegie Public Library and the Fayette County Board of DD. The group gets to know one another, discusses the books they read, as well as their personal interests, and they select the books to read as a club. For information about FCBDD’s local chapter or to become a volunteer facilitator, please contact Tim Stewart, community first coordinator at 740-335-7453 ext.218. 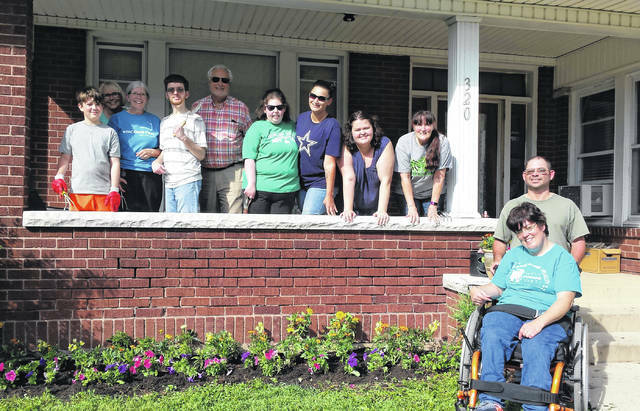 https://www.recordherald.com/wp-content/uploads/sites/27/2018/06/web1_MW-NCBC-Garden-Svc-Proj-6-12-18-2.jpgFrom left to right, neighbor helper, shelter administrator Christy Dunlap, book club facilitator Kathy Ison, book club member Chase Smith, neighbor Jack Thompson, book club member Chris Bell, assistant Leandra Jones, book club member Casey Hackworth, Modern Woodman member and book club facilitator Debra Grover, and book club members Mike and Kelly Annon.